What So Sizzle Bout Sizzling Suzai - Malaysia Fashion, Travel and Lifestyle Blogger: What-When-Wear? : The 072 Ladies Night! What-When-Wear? : The 072 Ladies Night! 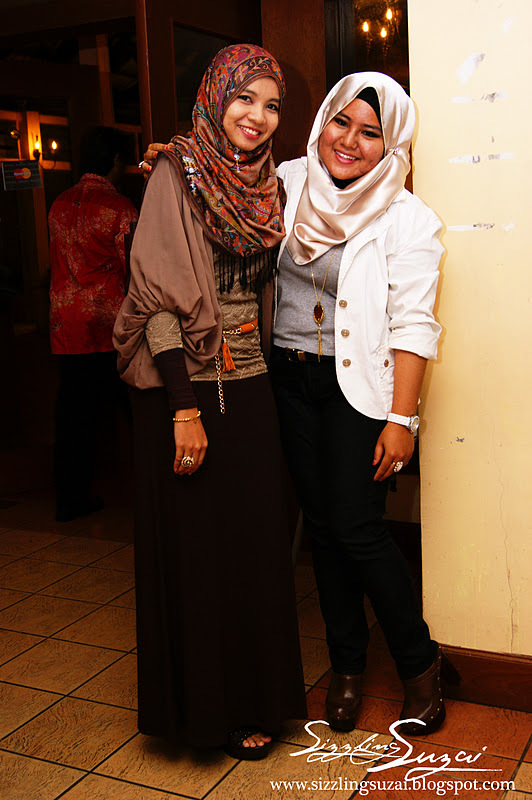 By Sizzling Suzai Wednesday, January 11, 2012 fashion, HIJABI world, What-When-Wear? its been a while that i don't post any "What-When-Wear?" entry right?! yup, its due to the NO FASHION EVENT in my schedule and NO HQ CAMERA by my side. hehe..but i guess you will probably see it more in the future as i'm always soooo excited to capture those snazzy fashionistas that i met whenever i hung out around K.L. hence, these are some of the stunning look that were captured during my graduation dinner on the last 22.12.2011. yup, it was a ladies night wherein NO MEN ARE ALLOWED plus everybody needs to dress-to-kill by following the GLAMOROUS theme! so, no wonder why lot of the look here are glitzy enough to attract your attention. i guess when the theme was point out to be GLAM, everybody will suddenly think of something Bling!Bling!. yup, it is wickedly correct but remember you don't wanna look like a embellished Christmas tree!